I know we are still a little ways off from the official bathing suit season, but between the spring like weather and seeing some extremely cute bathing suits at Victoria Secrets the other weekend I am kind of excited for bikini season. 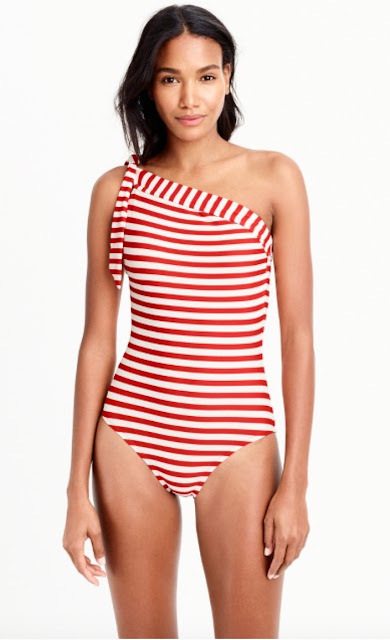 Usually I am not a big fan of one-piece swimsuits for the obvious reason that they are usually so unflattering. However this year I am loving the one-pieces just as much as I am the two-pieces. And the trends in swimwear this year is an absolute homerun; blue and white, gingham, stripes, off the shoulder, one shoulder, ruffles, high-waisted bottoms, a little touch of retro throwback here and there – just to name a few. I feel pretty confident in saying that basically everyone will be able to find a swimsuit that is not only flattering this year, but one that they absolutely love. I really like the one shoulder trend as well! Happy to see you enjoyed this post! !